A 35 year old man arrested by the operatives of Rapid Response Squad (RRS) of the Lagos State Police Command, has claimed that his pastor pushed him into selling of stolen vehicle. 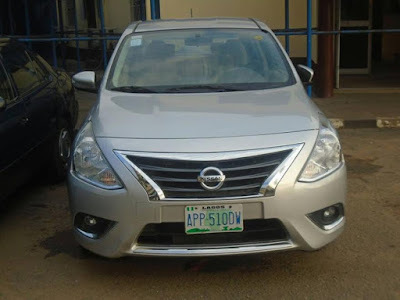 The suspect, Olawale Olabinwonnu, working with Cherubim and Seraphim Church in Igbogbo, Ikorodu, as an administrative officer, was arrested by RRS Intelligence Team on Tuesday, August 2nd, for trying to sell a Nissan Sentra, 2015 Model, stolen at gun-point. The original vehicle number was changed to a fake one (APP 510 DW) in order to sell it. It was recovered on Monday, August, 1st 2016 at a car park in Lekki, Lagos. The man who took the custody of the vehicle came forward to welcome before he was arrested. He assisted the police in the arrest of its marketer in Ikorodu several days later. Olawale sensed something was wrong with the vehicle, parked out of his Ikorodu residence and office along with his family to evade arrest. He was tracked on Sunday to another church in Ikorodu where he was arrested last Sunday after church service. "The vehicle was given to me to sell by Ahmed Abbey. I met him at Dammy Jay Hotel, Ikorodu. I went there to drink and he came to my table, bought drinks for everybody. That was how I liked him... When I was going home, I told him I was going home and he gave me N2, 000. Those were moments I was struggling and I had no job... I saw Abbey later that week to explain how he could help me get some money because I had no job. This was the time he asked me if I could help his sister ,who was travelling overseas to sell her car. And, I told him that I would try... I consulted my pastor twice on the issue of helping him sell a car. First, the pastor told me to go ahead and collect the car from him and sell it. I took the car from Abbey and began to market it but after about three weeks, I couldn�t get a buyer. He took the car from me. Some weeks later, I stumbled on him with the car and he challenged me that I didn�t want to help his sister sell her car... After a while, we agreed that I will help him to look for buyer. I consulted my pastor again for him to pray about it. This time, the pastor introduced me to somebody in Lekki who has a car park at a very conspicuous place, where we can put the car for sale... It was here the car was until I learnt that the car was stolen at gun-point... Since I was arrested, I have been calling Abbey to come and explain to the police that he gave me the car to sell, but most of the time, he avoided my calls, at times, he switched off his phone... Presently, he's no longer picking any call on that line." The State Police Public Relations Officer, SP Dolapo Badmos, noted that the suspect is helping the Police with investigation, adding that efforts are on-going to arrest others. The suspect along with the vehicle has been transferred to Special Anti-Robbery Squad (SARS) for further investigations.